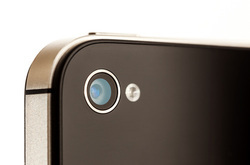 One of the most important and widely used features of a mobile phone after communication is it's camera. Every smartphone comes equipped with a camera now and the quality and features are constantly improving. The basic principles of what enables a camera to take great pictures remains the same - a good lens to gather the light and a sensitive film to develop the image, and for digital cameras they still need a great quality camera lens but the job of the old photographic film has been replaced by a tiny electronic sensor. We measure how sensitive the digital sensor is in megapixels. A pixel is the name given to the tiny coloured dots which make up images. One million pixels makes one megapixel. The larger the photograph or screen you put the image on the more pixels it will need to contain to remain sharp. When you see a photograph which looks grainy then it probably does not have enough pixels making up the picture. Therefore the number of megapixels is important, but only upto a point. As a general rule of thumb if the phone has more than 3.2 megapixels it will have a reasonably good camera. Go up to 4 or 5 megapixels and you will be able to print out detailed standard photos. Any time served photographer will tell you the lens is the most important part of a camera. The lens has the vital job of funneling the light onto the camera sensor. The better the quality of the lens the more light it will be able to focus and therefore the sharper the image will be. Quality lens manufacturers like Zeiss are fitted into top end smartphones. Zoom is a very useful feature on a camera phone. You may often want to quickly focus in on a particular area for more detail. Until recently all phone cameras have only offered digital zoom which means that the camera lens does not move to focus in on the detail but just a clever bit of electronics enlarges up the area of the image you are zooming in on. The downside is that by blowing up an area of the image you often lose it's sharpness and quality. 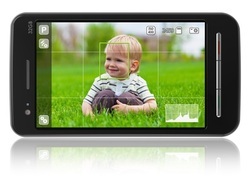 Nokia have now introduced optical zoom into their best camera phones which can zoom into an image with no loss of quality. Some cameras make use of both optical and digital zoom but you will always find that the optical zoom (where the lens moves in and out) gives the best results. Many phones now boast enormous megapixel counts but this does not automatically mean they will produce the best pictures. Without good quality lens and other features such as fast autofocus and image stabilisation the phone will not take great pictures. Autofocus does what it says on the tin, it focuses in on the image automatically, but beware some phones do this fast and others are painfully slow so you may actually miss that special shot you were after. Some camera phones can detect faces and even be set to only take the picture only when everyone smiles! Image stabilization is another very important feature often overlooked. This will help compensate for any hand-shake you may have and helps to take non-blurry pictures freehand with ease. Macro-focus is another useful feature common now which allows you to take close up shots that are still pin sharp. Phones which have built in GPS (which is becoming standard in most smartphones) can automatically tag your photo's with not only a time and date stamp but also the precise geographical location. 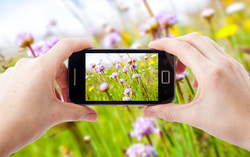 The flash is very important on camera phones for all but bright daylight photography. Because phone cameras have small diameter lenses they benefit even more from well lit subjects. Most phones are now equipped with LED flashes (LED stands for light emitting diode, these take little power and are very reliable) However they produce a very white light which does not show natural skin tones very well. The best flash is a xenon flash fitted to top end phones. The only downside to these is that they consume a lot of battery power. The software that drives the camera in phones is also becoming much smarter, with manufacturers adding extra processing options. Look out for features like High Dynamic Range (HDR) mode in which the, a camera takes multiple photos with different exposures and then blends the results together to create pictures with greater intensity levels across the image. The results can look especially good on landscapes and other outdoor shots. As the lenses in camera phones tend to be relatively narrow angle, a panoramic mode can be very useful for capturing bigger scale photos. All the main smart phones now have some form of panoramic mode built-in and many even let you take full 360-degree panoramic shots. The vast majority of camera phones can also be used to shoot video and some are even capable of capturing video at Full HD 1080p resolution. But even the best camera phones around tend to struggle to retain sharp images when capturing at 1080p, especially if there's a lot of movement. For most people 720p is perfectly adequate returning great quality video without blurring.